This year, believe with certainty that you will do exactly what you plan to do. Little Green Dot has always been about taking ownership of your life, doing the things that matter to you and simplifying to create opportunity for a healthier lifestyle. I called 2015 the Year of Becoming because when you know what you want, it’s time to step up and do the work to make it happen. And, whoah, that changes things! But it’s only in hindsight, that I can say: wait, what? I really did that? Because the truth is, 2015 felt like walking through water, full of resistance. I went into 2015 determined but also full of doubt, because I knew what I was up against. I’ve never talked about this before, but if you ever came to one of my workshops, you may have witnessed it. 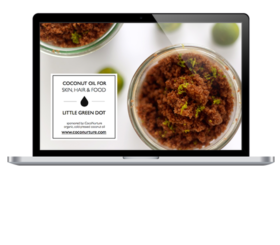 A big part of Little Green Dot is my in-person workshops, SIMPLIFY Skin and SIMPLIFY Home. I’ve been teaching them for three years now and still, each time I get up to demonstrate and speak, I become overwhelmingly nervous. But even though it terrifies me, in my bones I love it! You know that feeling? I love the entire process – coming up with the recipes, perfecting them, sharing them, inspiring people – I’m addicted. I reckoned that the nerves are normal, part of the gig. So I kept going, kept hosting more events, kept standing up. Right in the middle of a workshop, without warning, I had my first panic attack. 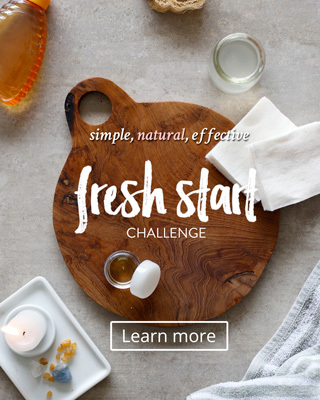 I was talking about natural cleaners and – in a moment my – throat seized up. I lost my voice and began coughing uncontrollably. It lasted for a full minute, I didn’t know what to do. I’m looking out at the class, they’re staring back at me with a look of Are you Ok? I couldn’t speak at all, nothing came out! Someone handed me a glass of water, the coughing stopped and my voice came back. I told everyone that I was “recovering from a cold” (sorry about that) The thing is, I had no idea what had just happened. I can still remember every panic attack I had in that first year of hosting workshops. I had dreams of doing more classes, bigger classes, filming them, sharing it with the world… but each panic attack chipped away at me, taunted me, bullied me, begged me give up. It made me scared of doing more, scared of saying yes to new opportunities, terrified of embarrassing myself. Then it hit me, I’ve gone through the worst, my biggest fear – I stood up in front of a crowd and freaked out. And it didn’t kill me. No one booed at me, no one complained or called me a fraud. I finished each class, and no one seemed to remember that little glitch. So I didn’t stop hosting workshops, and the panic attacks haven’t stopped either. If I sit and count (which I don’t like to), I can remember at least ten incidents over the years. I never know when it might happen again, but it’s always the same – my throat gets tight, I lose my voice and cough uncontrollably. During one class just recently, I had to walk out to go to the bathroom and breathe through it, luckily everyone was distracted making a recipe – and I snuck right out. Sometimes I’m not even feeling nervous when it hits me, which is especially annoying. I’ve realized that the panic attacks don’t really start in your mind, it’s much deeper, buried inside there somewhere. So when I tell you, that in 2015, my year of becoming – I hosted more workshops than ever, the reason it’s so momentous is because I’ve had to come against a force that has probably held me back, for most of my life: Self-doubt. It quite literally paralyzes me. And if you’ve felt it too, then you know how unrelenting it is. Self doubt tells you that you can’t do something, and during its cruelest moments, it tells you that you don’t even want it. Self doubt holds you captive and makes you sweat through unfair interrogations. It makes you second-guess yourself, hold back, go slow, procrastinate and when its successful, it makes you give up. Have you heard the saying “If your goals don’t scare you, they aren’t big enough” let me tell you, that has a whole new meaning, because my goals seriously terrify me. Which means, we need to be unrelenting too. All of the panic attacks, the procrastinating, holding back – it stems from self-doubt. Worrying I’ll get it wrong…. And that’s such a useless emotion. We can’t know if something will go wrong, if we’ll fail or succeed – so all you can focus on is creating the opportunity. Here’s what I’m noticing about my anxieties and belief. When you show up and do the the work, it starts to create the idea that you’re stronger than your fears, you’re capable. Doing the work, creates the belief. So don’t stop doing! It takes consistency, showing up everyday. And that’s where my second tip helps. Here’s something I’ve noticed. When you know what you want, and you work at it every single day, self-belief starts to come a little more easily. Whether it’s self-hypnosis or brainwashing… I don’t know. But consistency — doing the work — has a powerful way of planting the seed of belief in your mind. One of the most helpful practices for me has been my morning routine, to start the day with the right intentions. Here’s something I’d like you to try. It takes just five minutes, involves no effort and, done every day, will give you the consistency you need to banish self-doubt (or at least push it away a little). It’s part of my free email course, How to Become a Morning Person, which is relaunching on January 18th. Q1: What are you grateful for? This question gives you a dose of healthy perspective. No matter how bad things feel, you have so much to feel good about. No matter what mistakes you’ve made, you’ve done something right. It’s there around you in your life right now, take time to notice it and feel grateful for it. Q2: How do you want others to feel? This question reminds you that you have the potential to impact the people around you and create such a positive effect. It strengthens your sense of worth. You are a part of something, you matter and so do the people around you. It’s your family, your barista, your clients, your friends… feel connected. Q3: What are three things you will do today? This question gives you intense focus. You can do a hundred things today, you probably have a million things to finish. But what are three things that you believe with certainty that you will accomplish today. What are three things that if you complete, will give a sense of fulfilment and happiness. Big or small, doing three things everyday, keeps you in motion. I hope that 2016 is everything you believe it can be. If you’ve been struggling with panic attacks, self-doubt or sitting back when you know you can do so much more – believe with certainty that this year you will do the dreamy things that scare you. You can’t know the outcome yet, but what you can do is create the opportunity. Which means… there’s no time to waste, better get started! Whether you want to exercise more, work on side-projects that inspire you, cook meals for the week ahead or spend time taking care of yourself, I’ll teach you how to create time to do the things that are important to you.